Montserrat is like a diamond in the rough. Years and years of unfair hardship have remade this Caribbean travel destination, once the top choice for celebrities from around the world, into something wholly different… Something that requires more than a cursory glance to fully appreciate its inner beauty. And few people can be a better guide to the emerald green heart of Montserrat than a man curiously named Scriber. Completely devastated by hurricane Hugo in 1989, then nearly wiped off the map by the violent eruption of the Soufriere Hills Volcano in 1995, the people of Montserrat have had it rough and the troubles just keep coming. After our epic running of the Volcano Half Marathon in 2010, this year’s event has sadly been cancelled. There was even a tragic plane crash a month ago that struck at the heart of this small island community. And then there’s the periodic acid rain and blankets of ash caused by the volcano’s continued eruptions. But for all the pain and suffering endured by the people of this island, the natural beauty of Montserrat endures as embodied by the golden Montserrat Oriole. Critically endangered, this is the only endemic bird species of the island. Residing nowhere else in the world, this bird has suffered all of Montserrat’s cataclysmic volcano eruptions, hurricanes and even the odd ice age. As such, you couldn’t pick a better symbol for the resilient people of Montserrat, so it’s no surprise that it’s the national bird. What is a surprise however, is the fact that few Montserratians have ever been lucky enough to see one in the wild. And this is where Scriber comes in. Born James Daley, “Scriber” got his nickname from his childhood penchant for “describing” everything. As a youth, he even used Describer as his calypso moniker when performing across the island. Over time, it became shortened to just Scriber and he refocused his efforts from soca to the natural world. For decades, he honed his craft learning every trail, bird, frog, bush, and more on Montserrat working for the island’s government Forestry Division. Then in 2010, he opened Scriber’s Adventure Tours to take visitors on hikes through the Centre Hills and the green heart of Montserrat. I met Scriber bright and early (after a truly ill-timed adventure with Montserrat bush rum) for just such a hike on the Oriole Trail. Named after the national bird, I was promised a sight few locals had ever seen: the Montserrat Oriole frolicking in the wild. Right off the bat, Scriber was true to his name — plucking leaves off trees and going into precise (but still captivating) detail into their characteristics, uses, and place in local culture. And for the most part, the hike wasn’t too tough. Unfortunately, I was still struggling after the previous night’s libations and my traveling partner, Dave, was fresh off his grueling half-marathon run. Scriber didn’t mind. He just kept excitedly pulling us through the forest pointing out this and that and punctuating his sentences with exotic bird calls of all kind. Soon enough, he paused, listened, gave one more call, then pointed. There it was, just about 10 feet above our heads, a golden ball of feathers with a jet-black head and tail. It turned to look us over. I can’t be sure, but it almost seemed as though the bird recognized Scriber as an old friend. They chatted back and forth for a few moments in fits and starts of multiple calls, then once their morning catch-up was done, the bird flitted away into the green. From there, we saw countless other birds, frogs, plants and more on our hike. At one point we even crested a hill for a magnificent vista across half the island, but the highlight, by far, was my brief encounter with Montserrat’s national bird. Hiking with Scriber is one of the best ways to truly witness the natural beauty of this unique destination and can easily be done as a day trip from Antigua. Learn more about all the excursions he offers at his website or follow Scriber on Facebook. Just go easy on the bush rum beforehand and say ‘hi’ to that one Montserrat Oriole for me! Last updated by Patrick Bennett on 11/07/2018 . 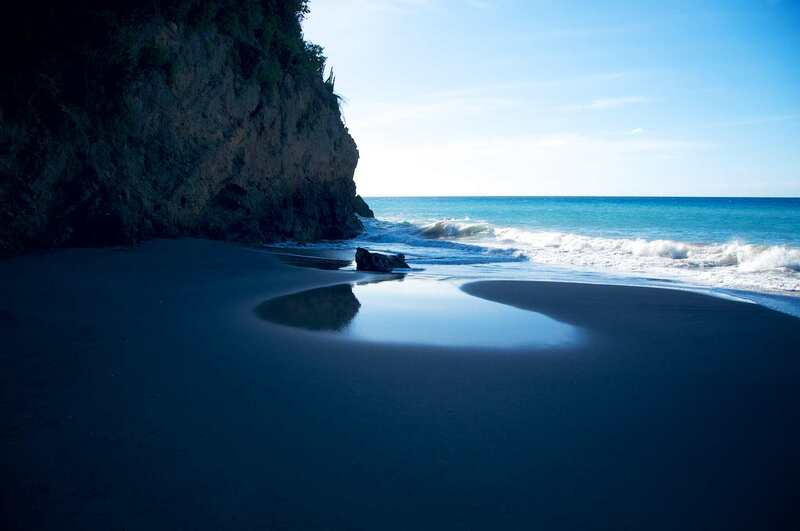 Made by temperamental and destructive Soufriere Hills Volcano, Montserrat's distinctive black sand beaches are actually made of teeny-tiny pieces of lava.